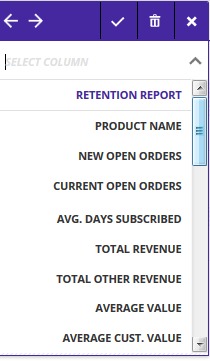 Sales Reports in ONTRAPORT are found in the Sales collection. There are nine categories of reports available with several configuration options for each category. These reports do not require any setup to activate. Eleven possible column headings to view the statistics at a glance. 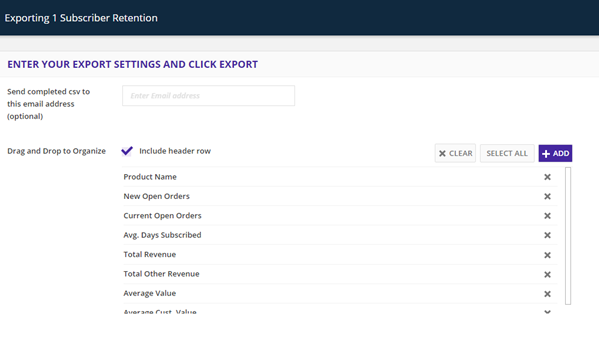 Export the data in CSV format: Select one or all of the Products and select Export from the Actions menu. The Export screen also shows the previously exported files under Export History. Eight column headings are available to see your data at a glance. Create Groups based on any of the eight fields. Stack field criteria to create meaningful Groups such as Products with an Average Value and Average Customer Value over a certain amount. Export some or all of the data by clicking the column, then selecting the Actions menu. The CSV file is emailed to the email address you specify. The Export History section shows all past exports, ready to download again. The Subscription Sales report provides information on completed, pending, canceled subscription orders as well as subscriptions currently in collections. Fourteen column headings show your Subscription Sales data. Groups can be created to give you custom views of your Subscription Sales. Stack the field criteria to create Groups such as the Least Popular Subscriptions. Export: Select the data you want to export and click Export in the Actions menu. Data is emailed to any email address and also saved in the Export History section. The Transaction Logs report lists individual transactions by Contact. It includes pre-formatted or custom date ranges and Group options to organize your views of the data. 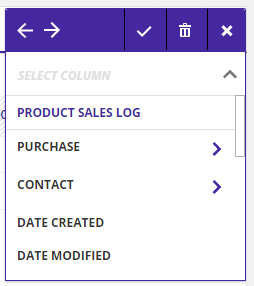 Fourteen column headings are available to customize your view. Select an individual transaction to act on it. In the Actions menu you can Re-run, Refund or Void a transaction, Re-run Commissions, Re-Send Invoices, Email the Contact or Export the selected transactions. Groups help narrow your view of the transactions. Group by any of the fourteen fields, or create custom views using multiple fields to create the Group. 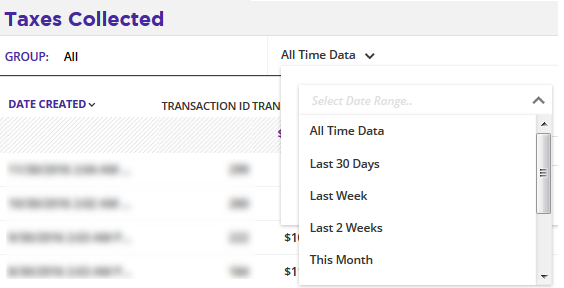 Select transactions in any Group, or select all transactions, for any date range, and click Export on the Actions menu to export them. The CSV file that is emailed to you can be manipulated in Excel, OpenOffice or LibraOffice spreadsheet programs. Twelve native column headings are available. Three drill down sections exposing all of the fields for the Purchase details, Contact who purchased and Product details provide additional display options. Click the right arrow next to the Purchase section to reveal the following transaction-related fields. 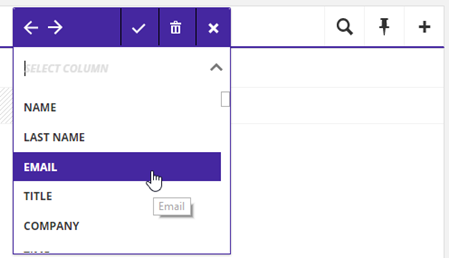 Expose all of the Contact fields by clicking the right arrow next to Contact. 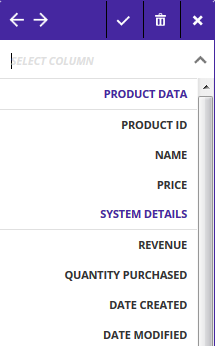 The Product right arrow also exposes more fields related to the Product as configured in ONTRAPORT. 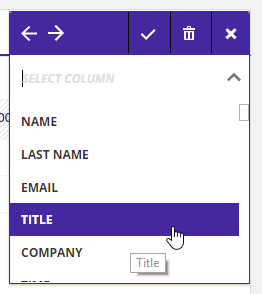 Create Groups using any of the fields listed above for the column headings. 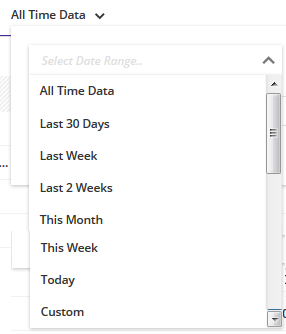 Set a custom date range or select one provided in the date selection box. Select any or all of the data, in any Group, and click the Export link in the Actions menu. 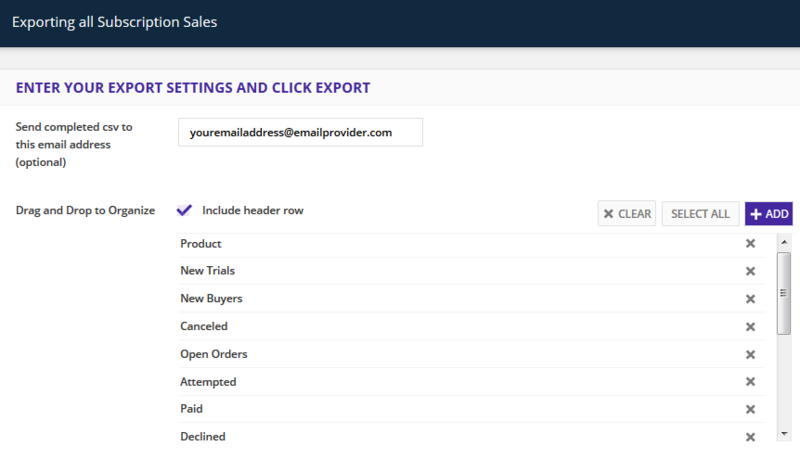 The export will be emailed to any email address you desire in a CSV file. Prior exports are listed on the Export page for downloading directly. This report provides a snapshot of customer value by Contact name. The available fields for column headings are Contact Name, Email, Last Month Total, All Time Total and Current Open Order Total. 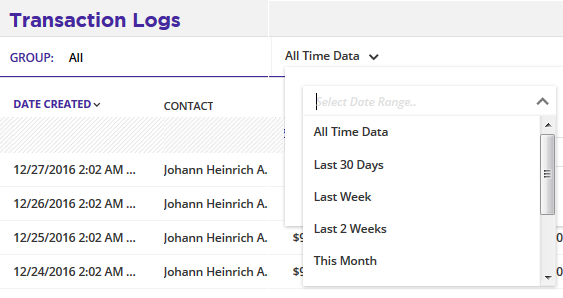 Create Groups to segment your Customer Value display by any of the fields, Contact Name, Email, Last Month Total, All Time Total or Current Open Order Total. For example, create a Group of Contacts with a current Open Order to view their customer value. 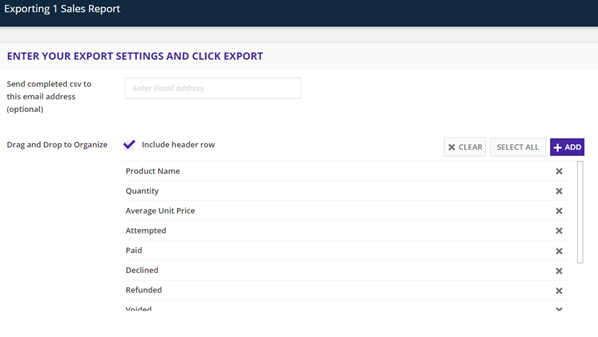 Export options are similar to all other Sales Reports. You can export a single record, any Group of records, or all records, with the CSV file emailed to any email you desire. Shipping Collected allows reporting by date range and, as with other reports, can be exported in a CSV file. Thirteen fields relating to the transaction are available as column headings. Create Groups based on any of the thirteen fields mentioned above. You can stack Group criteria to create reports such as "Shipping Collected / Transaction Refunded". 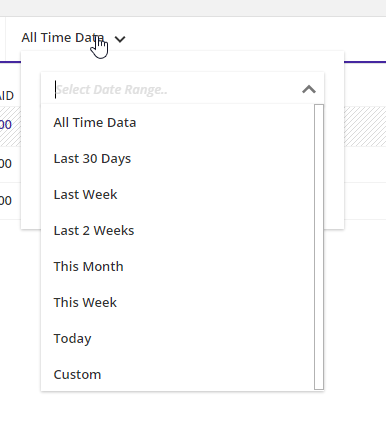 Use the date options drop down to select a custom date range or any of the pre-formatted date ranges. With options similar to the Shipping Collected report, Taxes Collected includes the ability to sort by date range and export the result as a CSV file to any email address you desire. Eleven fields relating to the transactions are available as column headings. Create Groups based on the eleven fields. Stack the Group criteria to create reports such as "Taxes Collected / Transaction Refunded". Select the date range to filter the data further. Select data and then the Export link in the Actions menu to create a CSV export of the data. The Open Orders report provides information on the upcoming payment plan, subscription payments or the order to be processed at the end of a free trial period. In addition to the Next Payment Date, Payment Amount, and Type of payment, the Open Orders report exposes the Contact information through the use of a drill down field named Contact. 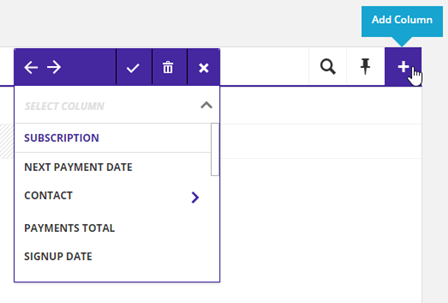 The Actions menu allows you to Delete a Subscription, Edit the Open Order or Export records. Q. Can I create a custom report? A. Many of our reports allow customization through the use of Groups and date ranges. We do not have a way to create ad hoc, custom reports at this time. Q. I really want better metrics than these reports give. A. The Dashboard creates metrics!